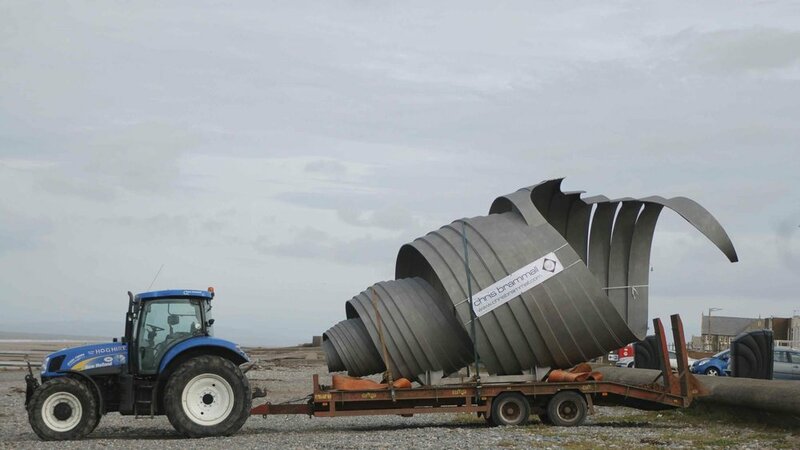 The Mythic Coast is an ongoing project conceived by Stephen Broadbent and forms part of a cultural vision and strategy document created by the studio for the Wyre Coastline and linked to the ongoing sea defence works in Cleveleys. This vision document formed the basis of a successful Sea Change funding application, which recognised schemes that have the potential to regenerate seaside towns through cultural and environmental enhancements. The Sea Change grant funded three distinct projects, an observation tower at Rossall Point, the regeneration of Marine Hall Gardens, Fleetwood and the Mythic Coast Art project. The creation of a new narrative for the Wyre coastal region, connecting together local history, geography, environment, mythology and folk-lore. This has been delivered as a printed book, and developing further with an e-book, audio book, and through a website. Local storytellers will be trained to deliver the story in situ along the promenade at Cleveleys. Education resources will be provided for teachers in Lancashire district, based around the narrative. The content of the narrative, including the text and the illustrations, is available for the public to make use of under a Creative Commons license, allowing community groups, education organisations and charities to easily make use of the story for social benefit projects. Content was initially hosted on a website that was maintained and curated for the year following publication of the book. 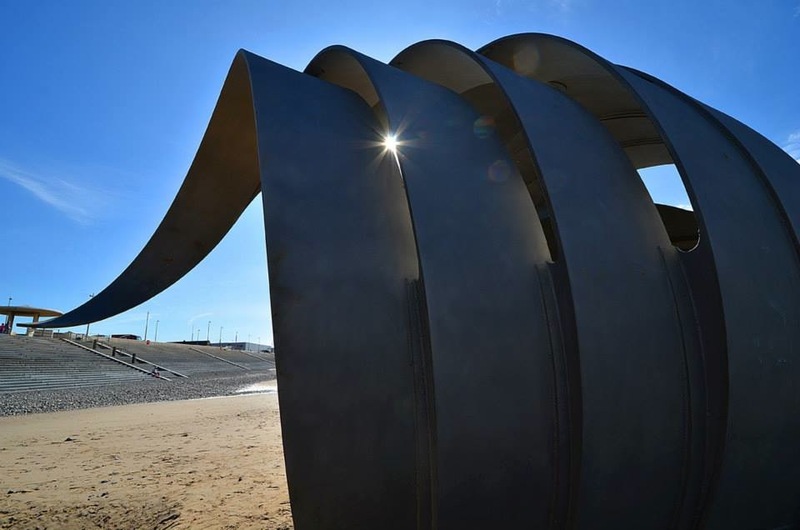 The aim of the art project has been to develop a narrative for the seafront from Cleveleys to Fleetwood, that would draw people along the coastline and connect communities. 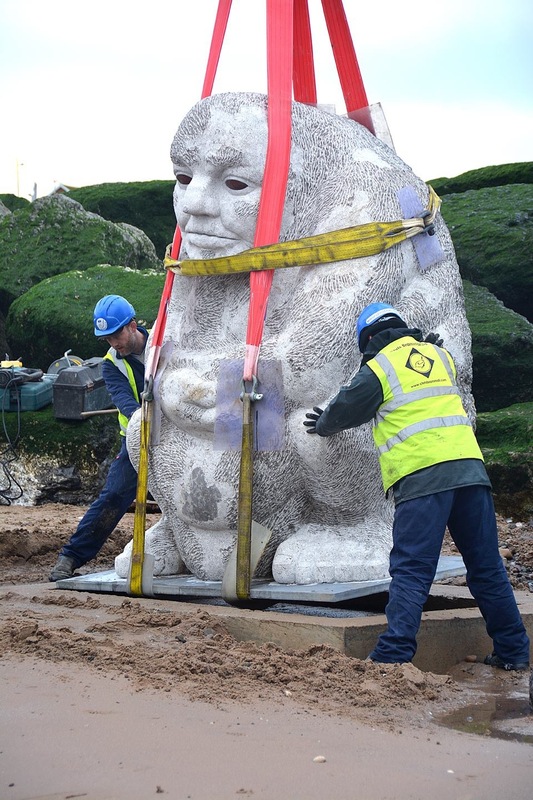 This narrative forms the foundation for cultural and art interventions on the seafront. Increase young people’s engagement with the local landscape, history and environment. Increase perceptions of ownership and belonging in relation to the ongoing development of the promenade at Wyre. Together with the installation of artworks by Broadbent along the promenade, increase awareness and enjoyment of the Wyre Coast. Increase the tourism offer of Cleveleys, Fleetwood and Rossall. Provide a strong focus for community celebration, perhaps as one element for an annual festival. Generally increase awareness of the Wyre coast as a tourist destination. Support the ongoing economic redevelopment of the Wyre coast. Promote cultural development along the Wyre coast. The picture book is aimed at a child in the centre of Key Stage 2, with the hope that the book can involve both parents and children, in communal reading. The narrative deals with themes that are suitable for mature nine-year olds, such as loss and fear, and is written for a confident reader of that age. The text is supported throughout by expansive and detailed illustrations that bear equal narrative load and support less able readers. The Sea Swallow story was written by children’s author Gareth Thompson. Gareth's understanding of the coastlines mythology, developed through special story collecting days with the community and conversations with local historians and ecologists. The book is illustrated by Hannah Megee, whose creative flair saw her beat off stiff competition from over 100 artists, in the nationwide search for the right illustrator. Hannah’s designs also provide the inspiration for a trail of Mythic Coast artworks. Allowing people to 'walk' the story with prompts for the imagination along the way - Shipwrecks, Sea Swallows, the Seashell, the Ogre and the Paddle, all reflect elements of the book. In July 2011, copies of The Sea Swallow were given to 4,200 Wyre schoolchildren aged 7 – 11. The book is also available to buy online. The Sea Swallow is a 10m tall structure that brings to life Wyre’s Mythic Coast storybook ‘The Sea Swallow’. The coated aluminium sculpture, has the feel of 'a book coming to life', with the two sea swallows symbolic of the town’s protectors emerging from the page. This feature acts as a visual beacon to draw people from the town centre to the sea front. The granite was supplied by Hardscape and the aluminium structure fabricated and installed by Chris Brammall Ltd. of Cumbria. The Ogre is the big baddy of the Mythic Coast story, created by author Gareth Thompson and illustrated by Hannah Magee. The Ogre stirs up the sea with his giant paddle, threatening the whole Wyre waterfront community, only to be thwarted by the story's hero Mary and her golden shell. 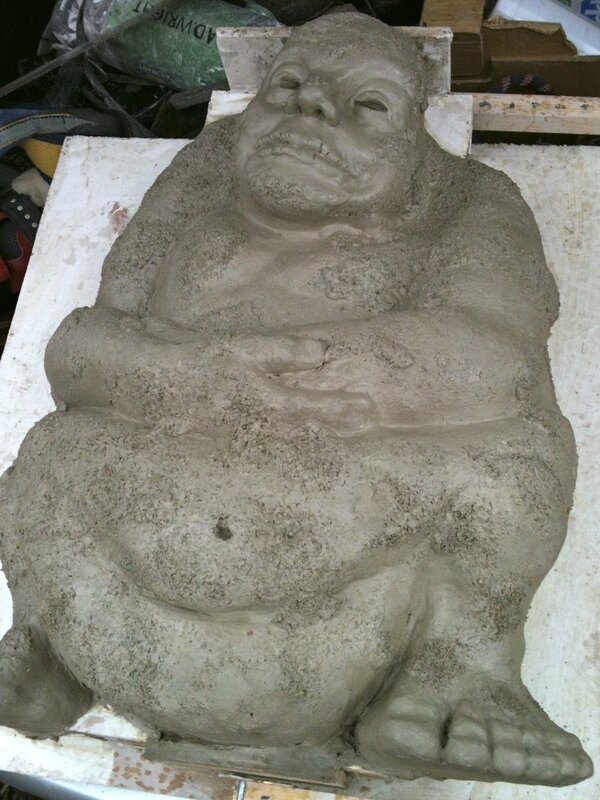 The Ogre is one of a series of artworks and features that animate the Mythic Coast story trail along Cleveleys promenade in Lancashire. He was hand carved from a single fifteen ton block of limestone by the stonemason Adrian Wright and installed below the tide line on Cleveleys beach. The Ogre's Paddle is another visual prop to the Sea swallow story, set along Wyre's Mythic coast. The paddle was fabricated in purple heart and carved with elements and text from the story by the woodcarver John Merrill. It is sited on Cleveleys promenade, just along from the ogre. Mary is the hero of the Mythic Coast story and her adventure to save the town from a devastating tsunami, depended on capturing the Golden Shell from the Sea Ogre in his lair, down in the great Lune Deep. The shell is a dramatic visual prop to this story, made more significant by being swamped by the tide, twice daily. This does allow access to the shell at low tide, perhaps to stand and listen inside the structure to the sounds of the sea and maybe to read some of the words from the storybook. It is an adventurous piece of sculpture and a very popular destination for families and photographers throughout the year. Our concept models were beautifully developed and crafted by Chris Brammall and his team, a remarkable achievement, culminating in this 9m long, stainless steel structure, weighing seventeen tons. This is a memorial to all known ships lost along the Fylde coast, North West England - from Fleetwood to Lytham St Annes. 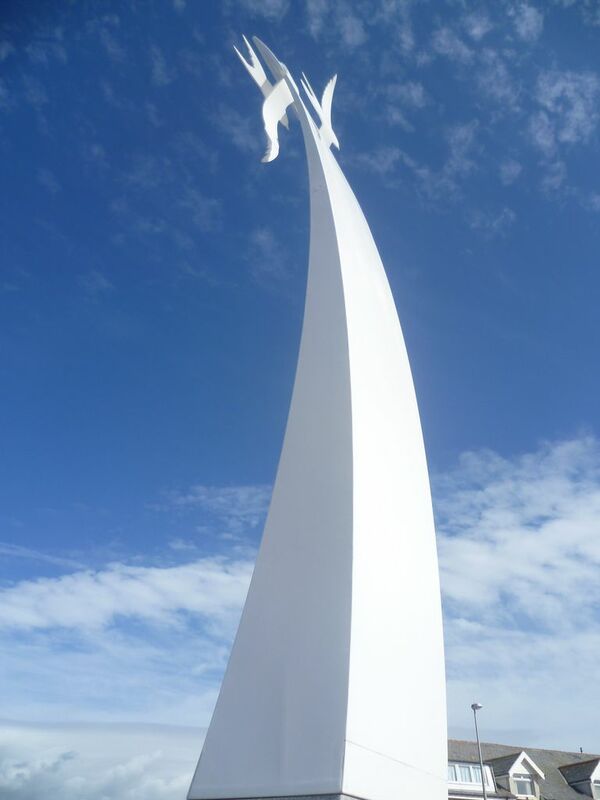 It is positioned on the promenade at Cleveleys, adjacent to the site of the most recently lost ship - The Riverdance. The artwork takes the form of a 4.6m tall ‘wall of words’, with the names of the ships pierced through sheets of 15mm thick weathering steel. A larger text, in relief, runs the full height of the memorial, with words taken from the famous Seaman's Hymn. 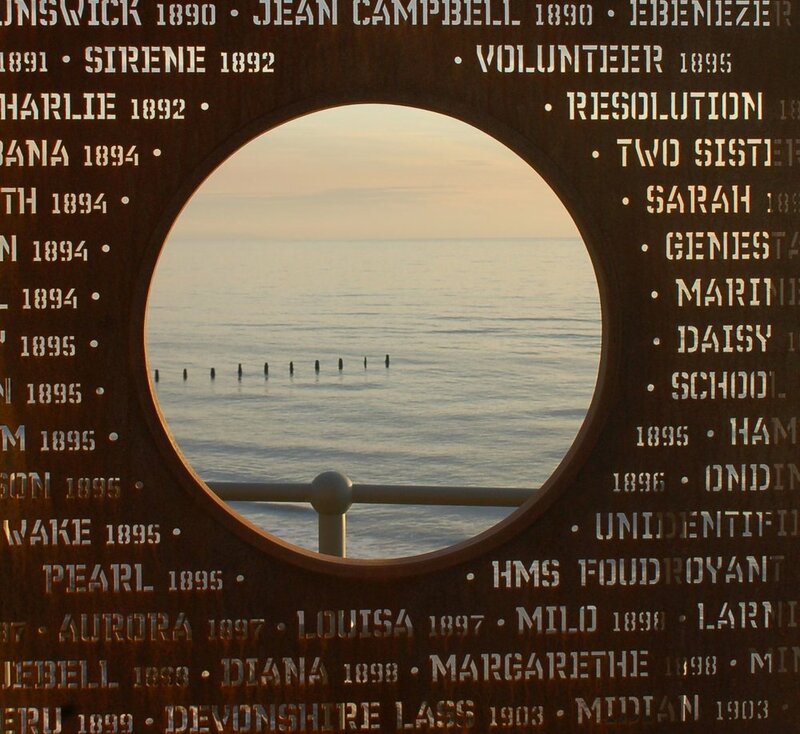 A circular aperture frames a significant view along the Fylde Coast, having the feel of a porthole and presenting a photographic opportunity for visitors. The decorative metalwork is supported by two large greenheart timber structures, which house two plaques listing the names and dates of the ships, along with a little more information, regarding the tragic event which lead to the loss of a ship. These multi-coloured Sea Swallow birds were planned to sit along the seawall at Cleveleys promenade. They have been temporarily removed following the unfortunate theft of a number of them, and are awaiting re-siting at Rossall . The birds are cast in resin. Have you walked the Mythic Coast Trail? 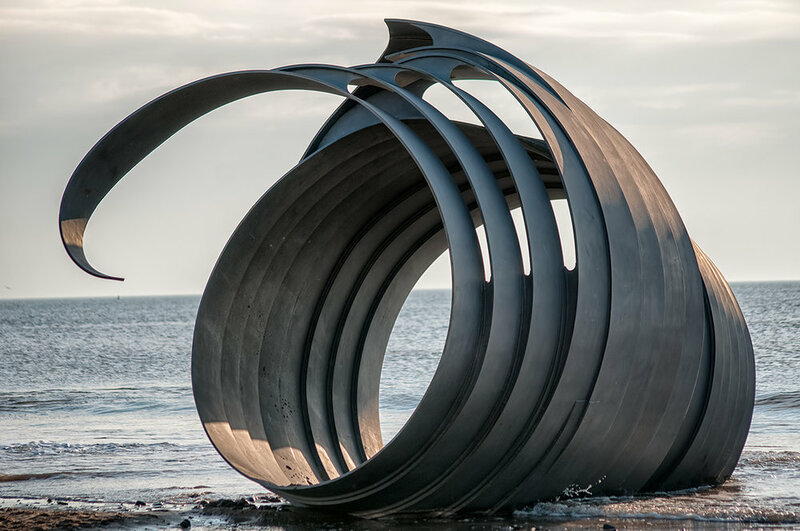 Wyre’s Mythic Coast Artwork trail brings a magical element to the Cleveleys seafront.